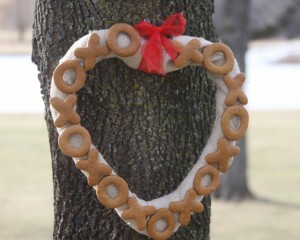 You can create this simple hugs and kisses wreath for just a few dollars to help celebrate valentines Day. It is a fun activity to do with the kids and makes a great rustic decoration for your front door . All you need is a few scraps of fabric, a wire heart wreath from the Dollar Store, and some ornamental gingerbread dough. Here is the final creation that the kids and I made for Valentines Day using our ornamental gingerbread cutouts. 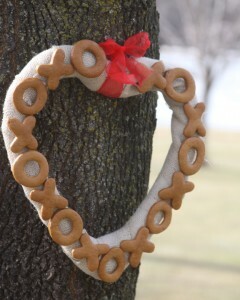 This little hugs and kisses wreath is a rustic and simple wreath to hang on the door to show your love. This wreath began from a wire Dollar Store heart and sends a sweet message using cut out gingerbread X’s and O’s. This wreath was so simple and easy to make. 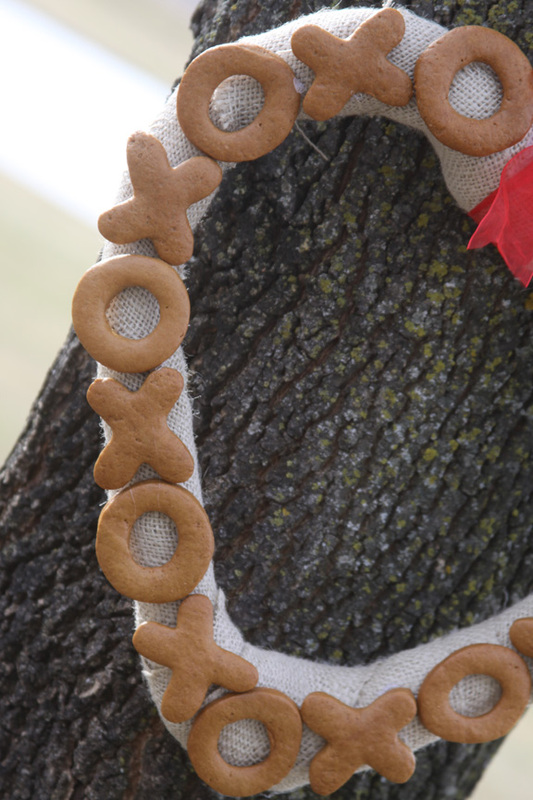 I used our ornamental gingerbread dough to cut out some X’s and O’s for this wreath. This was not only a fun activity for the kids and I to do together, but we ended up with a ton of great ornaments to decorate the house with for Valentines Day. You can find the recipe here for the ornamental gingerbread dough. 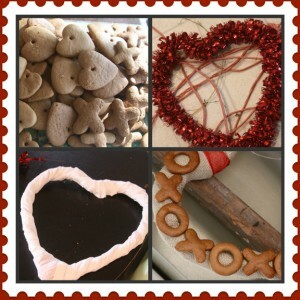 With this recipe we created ornamental gingerbread hearts to hang, chalkboard dipped hearts to hang and use as gift tags, and this cute wreath. I found the red heart wreath at the Dollar Store and used it as the base for my wreath. It had a heavy wire skeleton that was just right for creating the heart shape that I wanted. It was covered in a red metallic paper that wasn’t all that attractive, so I decided to cover it first. To give the wreath a fuller, more rounded look I added a few layers to it. First I used some scraps of fabric that I had and hot glued and wrapped it around the wreath to make it a little fuller. I went around the whole wreath twice wrapping and gluing as I went. Then I used some scraps of burlap that I had left from another project to cover that with. I used long strips of burlap that where about 2 1/2 inches wide and that had raw edges. I wanted the wreath to look natural and rustic, so I was okay with the fraying burlap edges. Once my burlap was glued and secured around my wire heart I was ready to add the hugs and kisses. I used my baked ornamental gingerbread X’s and O’s to add a special touch to the wreath. I coated the shapes with two layers of a matte protective finish before attaching them. Once they were sealed, protected, and dried I just hot glued them to the burlap covered heart by alternating letters. I laid them all out around the wreath to get the spacing right before I began gluing them down. Once they were arranged and glued I added a simple red bow for a touch of color. The bow is the perfect way to hang the wreath and adds a festive touch for Valentines Day. I hung the wreath on the front door of the house so everyone that comes over is greeted with hugs and kisses before the even come in!